VCE Testing System is an older name of VCE License - VCE Software testing product specially developed for corporate clients and for use by businesses and other organizations. Although VCE Testing System has been discontinued, it will remain in history. VCE Testing System was Avanset's first product that targeted businesses and institutions. VCE Testing System allowed clients to create, manage and conduct interactive tests over a network. 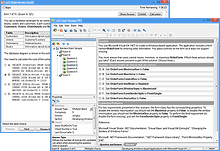 Hence it provided clients with centralized test management and data storage, advanced exam editor, test mode customization features, as well as a variety of data export possibilities. Although VCE Testing System has been discontinued, Avanset still caters to requirements of businesses and institutions that need flexible interactive testing software in their day-to-day processes. VCE License provides organizations and institutions with the flexibility and convenience of VCE Software, adjusted to the need of being used on multiple workstations, both for employee training and testing. Each VCE License subscription includes 30 installations, with the possibility of having it upgraded to any exact number up to 100. As a result, you pay exactly for what you use - and not a penny more. Each company is unique, and VCE Testing System recognizes that by being fully customizable and capable of meeting the needs of each and every organization. VCE Testing System is fully customizable to meet the unique needs of companies and other organizations. It provides a tailored training system, which can be used for employees in any industry. VCE Software can be used in the variety of fields, with most Avanset corporate customers using it for HR purposes, including pre-employment testing or employee proficiency testing as well as other HR tests organizations would like to administer.